body Conditioning and Comfort for the wearer. These three C's improve body function and enhance fitness quality. This is an entirely new high performance sportswear. One of C3fit's most powerful features is its compression design. 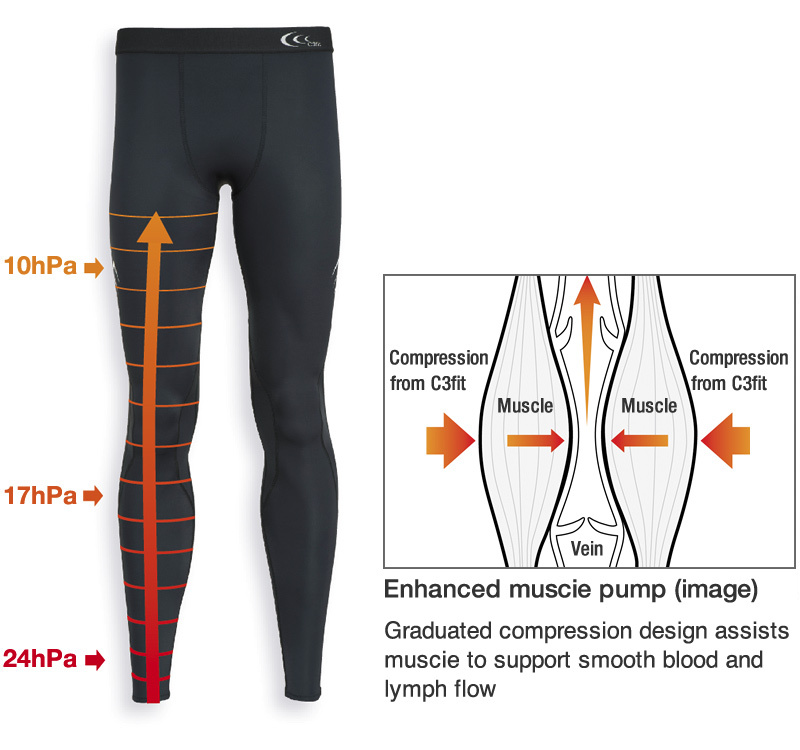 Applying an optimal amount of compression, C3fit design suppresses excessive muscle vibration to minimize energy loss and enhances efficiency in physical exercise. C3fit's long tights, calf sleeves, and high socks are certified as General Medical Devices in Japan. These devices feature graduated compression that exert the strongest pressure on the ankle. Gradually reducing pressure further up the leg. 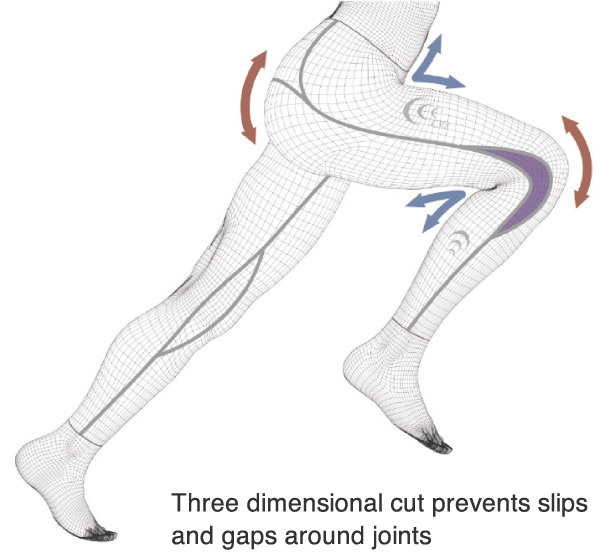 The graduated compression design improves the performance of muscle contraction. It facilitates the movement of the venous blood from the extremity to the heart and helps control the stagnation of the venous blood and lymphatic fluid in the limbs. C3fit's comfortable feel is made possible by a completely original design based on an uncompromising pursuit for the perfect fit. Its proprietary crescent patterns achieve the maximum 3D effect using a minimum number of seams. C3fit design reduces fabric bunching behind the joints and slipping in the hip area so that the fabric can closely follow your body movement. C3fit also features a gentle fit that keeps you comfortable even after long hours of use; as well as UV properties to help protect your body from harmful radiation during exercise. C3fit's long tights, calf sleeves and high socks; the brand's core items; are applicable to a full range of activities. The graduated compression design helps to promote blood circulation; supplying oxygen and nutrients to every part of the body. C3fit's medical grade garments help you condition your body before exercising and help reduce recovery time faster afterwards. They are also great for reducing leg swelling during your daily activities and during long hours of travel. * C3fit's compression stockings are high-performance, certified General Medical Devices in Japan that feature graduated compression, with the strongest pressure exerted on the extremity and eased gradually toward the top of the limb.